"Grand Army of the Republic Highway" redirects here. For the Vermont state highway with that name, see Vermont Route 15. U.S. Route 6 (US 6), also called the Grand Army of the Republic Highway, honoring the American Civil War veterans association, is a main route of the U.S. Highway system. While it currently runs east-northeast from Bishop, California to Provincetown, Massachusetts, the route has been modified several times. The highway's longest-lasting routing, from 1936 to 1964, had its western terminus at Long Beach, California. During this time, US 6 was the longest highway in the country. In 1964, the state of California renumbered its highways, and most of the route within California was transferred to other highways. This dropped the highway's length below that of US 20. US 6 is a diagonal route, whose number is out of sequence with the rest of the U.S. Highway grid in the western US. When it was designated in 1926, US 6 only ran east of Erie, Pennsylvania. Subsequent extensions, largely replacing the former U.S. Route 32 (US 32) and U.S. Route 38 (US 38), have taken it south of US 30 near Chicago, Illinois, US 40 near Denver, Colorado (past the end of US 38), US 50 at Ely, Nevada, and even US 70 near Los Angeles, California, due to its north–south alignment in that state. The modern US 6 in California is a short, two-lane, north–south surface highway from Bishop to the Nevada state line. Prior to a 1964 highway renumbering project, US 6 extended to Long Beach along what is now US 395, California 14, Interstate 5, Interstate 110/California 110, and California 1. Despite the renumbering having removed all freeway portions, it is still part of the California Freeway and Expressway System. US 6's former routing included a short segment of the famous Arroyo Seco Parkway. Currently, US 6 begins at US 395 in Bishop and heads north between farms and ranches in the Chalfant Valley at the base of the 14,000-foot (4,300 m) western escarpment of the White Mountains. After about 30 miles (48 km) Benton is reached, which has a cafe and gas station. California 120 begins here, heading west past Mono Lake through Lee Vining, over Tioga Pass, and through Yosemite National Park to the San Joaquin Valley. US 6 continues north to the Nevada state line. From the California border, US 6 heads northeast through the semidesert Queen Valley with Boundary Peak (Nevada), Nevada's highest summit, and Montgomery Peak in California on the right. These twin peaks are the northmost high summits of the White Mountains, both over 13,000 ft (4,000 m). The highway then climbs into the Pinyon-Juniper zone and crosses Montgomery Pass 7,167 ft (2,185 m). From the pass, US 6 descends into barren shadscale desert, passing Columbus Salt Marsh on the left, then merging with US 95 from Coaldale Junction to Tonopah. Nevada Test and Training Range begins about 15 mi (24 km) southeast of Tonopah. Just east of Tonopah, US 6 continues east across a series of desert mountain ranges and valleys, including the Monitor Range. At Warm Springs, State Route 375, also known as the "Extraterrestrial Highway", departs to the southeast and US 6 assumes a northeasterly alignment across the Reveille, Pancake, Grant and White Pine Ranges. Rainfall increases eastward, so valleys become less barren and peaks over 11,500 ft (3,500 m) add scenic interest. Ely is the largest city on Route 6 in Nevada. US 50 joins Route 6 at Ely. East of Ely, Routes 6/50 cross the Schell Creek Range, known for verdant forests and meadows, and for a large deer and elk population. The highway descends to Spring Valley, then crosses the Snake Range at Sacramento Pass, north of Nevada's second-highest mountain, Wheeler Peak, where a branch road accesses Great Basin National Park. Beyond the pass, US 6 passes just north of Baker, a Mormon farming community, and reaches the Utah state line. US 6 enters and leaves Utah concurrent with US 50. However, the two routes are different through the state. US 50 is the newer and shorter route. US 6 is the former route of US 50. US 6 forms an arch-shaped route with Spanish Fork at the apex. US 6 is now concurrent with Interstate 70 for a significant portion of its length from the Utah state line to Denver. Within the city limits, US 6 follows Denver's 6th Avenue (known as "6th Avenue Freeway"). The highway then travels north briefly, and it follows Interstate 76 for most of its length east of Denver. It is unsigned while it is overlapped. The highest altitude along US 6 is 11,990 feet (3,650 m) at Loveland Pass, where it crosses the Continental Divide. It continues down Clear Creek Valley until it reaches I-70, where it is briefly overlapped until I-70 leaves Clear Creek Valley. US 6 continues down Clear Creek and into Denver, where it turns into a freeway with six lanes. East of Denver, it continues east while joined with I-76 until it reaches Sterling, where it diverges from the interstate. The last town in Colorado that it passes is Holyoke. From the Colorado state line, US 6 starts going southeast. The first town it goes into is Imperial. US 6 conjoins with US 34 near Culbertson, passing through McCook. US 6 then moves to the northeast, through Hastings. At Hastings, US 34 diverges and moves north. US 6 parallels Interstate 80 north of Milford until it reaches Lincoln. At Lincoln, US 6 becomes West "O" Street, then Cornhusker Highway and moves north of I-80 outside of the city, paralleling I-80 to Gretna. There US 6 moves due north and becomes the West Dodge Expressway and Dodge Street in Omaha. It passes through downtown Omaha on parallel one-way streets and runs concurrent with Interstate 480 in Omaha on its last Nebraska segment. East of Omaha, it crosses the Missouri River to enter Iowa at Council Bluffs, on a girder bridge completed in 1966 that replaced the Ak-Sar-Ben Bridge, which was the first road bridge to connect the two cities. US 6 enters Iowa at Council Bluffs, across the Missouri River from Omaha where it intersects I‑29 within the first mile. Through Council Bluffs, it travels along Broadway and Kanesville Boulevard. Further east, the highway briefly overlaps US 59 near Oakland and continues east until Lewis. There, it turns sharply north-northeast to Atlantic where joins US 71 until I‑80. It overlaps I‑80 between US 71 and US 169 at De Soto. US 6 travels north with US 169 to Adel, then turns east to go toward Des Moines. It enters the Des Moines metro area along Hickman Road in Waukee and then forms the border between Urbandale to the north and Clive and Windsor Heights to the south. In Des Moines, Iowa Highway 28 joins US 6 at 63rd Street and the two routes head east and north on Merle Hay Road. US 6 splits away at Douglas Avenue and it continues east. Near the Des Moines River, Douglas Avenue becomes Euclid Avenue. In the northeastern part of the city, it intersects US 69 and I‑235. The highway turns onto Hubbell Avenue and heads into Altoona where it meets US 65 and rejoins I‑80. East of the Des Moines metro area, US 6 again overlaps I‑80 until they reach Newton. There, it splits away to the north and runs parallel to the Interstate. It passes through Grinnell, Marengo, and the Amana Colonies before arriving in Coralville. In Iowa City, it passes through the University of Iowa campus on the banks of the Iowa River. The highway heads southeast from Iowa City towards West Liberty and then more easterly to Wilton. At Wilton, the highway heads north to rejoin I‑80 until they reach Davenport, Iowa. After a short overlapping of I‑280, US 6 enters the city along Kimberly Road, on which it remains until I‑74. The two routes then run south to cross the Mississippi River into Illinois on the I-74 Bridge. In Illinois, US 6 parallels Interstates 74 and 80, mostly along its original routing, overlapping with I-74 for its first five miles (8.0 km) and I-80 for the final two miles (3.2 km) of its routing in Illinois. US 6 directly serves the downtowns of many cities for its length, including Oak Forest, Tinley Park, Moline, Geneseo, Atkinson, Annawan, Princeton, Peru, LaSalle, Ottawa, Channahon, and Joliet—unlike US 20, which, in Illinois, mainly consists of freeway sections that bypass the cities US 6 serves. Like nearby U.S. highways 30 and 52, US 6 skirts the Chicago city limits. US 6 crosses the state line and shares the same Borman Expressway with Interstate 80 and Interstate 94 through Hammond and Gary, until State Road 51 (exit 15); it then runs south for about 2 miles (3.2 km) and turns east until it meets US 421 in Westville, then runs south for a mile, then east until it meets US 31 and US 35, and it shares the same road with US 33 for about 5 miles (8.0 km) until Ligonier, where US 33 breaks south toward Fort Wayne. From there it is mostly two lanes through Indiana until it meets the Ohio state line just east of Butler. Before the Borman Expressway was completed, US 6 was on Ridge Road, portions of which are now signed Business US 6. US 6 enters Ohio from Indiana in Williams County. It travels through Edgerton, then just south of Bryan before it passes through Napoleon, Bowling Green, and Fremont, before turning northeast towards Sandusky Bay and Lake Erie. After passing through Sandusky, the route follows the southern shore of Lake Erie, passing through Huron and Vermilion. After crossing the Charles Berry Bridge in Lorain, it passes through the western suburbs of Greater Cleveland as Lake Road in Sheffield Lake, Avon Lake, Bay Village, and Rocky River, and Clifton Boulevard in Lakewood and the West Blvd./Edgewater neighborhood of Cleveland proper. US 6 follows the Cleveland Memorial Shoreway into Downtown Cleveland, entering downtown by crossing the Detroit-Superior Bridge. US 6 follows Superior Avenue through Public Square and the East Side of Cleveland before turning east onto Euclid Avenue in East Cleveland and Chardon Road in the city of Euclid. US 6 continues eastward through Geauga County and finally into Ashtabula County before entering the state of Pennsylvania slightly north of Pymatuning Reservoir. Ohio also has an alternate route of US 6 in the Cleveland area. US 6 runs for 394 miles (634 km) in Pennsylvania between its entrance point 20 miles (32 km) west of Meadville and its exit at Matamoras. From the Ohio border to US 322 in Conneaut Lake, the route runs in a southeasterly direction. US 6 then joins US 322 and heads east to Meadville, picking up US 19 west of the city. South of downtown, US 322 splits from the concurrency while US 6 and US 19 remain concurrent through Meadville. The two routes continue northward to Mill Village, where US 6 and US 19 split at a junction with US 6N. For the remainder of its routing in Pennsylvania, US 6 runs roughly parallel to the New York-Pennsylvania border. Along the way, US 6 is concurrent with US 62 for a short distance near Warren. US 11 joins US 6 from the north in Factoryville. They run concurrently to Scranton, where US 11 continues south and US 6 east. At Milford, US 6 meets US 209. The two routes embark to the northeast, crossing the Delaware River from Matamoras to Port Jervis, New York. The 79-mile (127 km) portion of US 6 in New York is located primarily in Orange County, with lengthy stretches in Putnam and Westchester counties, and a small segment in Rockland County. The route enters the state along with US 209 in Port Jervis. The two routes split just north of town, with US 209 taking a more northerly route to access Kingston. US 6, in contrast, runs primarily east–west through southern New York. A section of US 6 runs concurrent with New York State Route 17 (the Quickway, or Southern Tier Expressway) between Goshen and Harriman. At Harriman, NY 17 becomes an at-grade road and heads south, while US 6 remains a limited-access highway as it heads east into Harriman State Park. Near the east side of the park, US 6 intersects the Palisades Interstate Parkway and runs concurrent with it to the Bear Mountain Bridge, where US 6 is joined by US 202 as it crosses the Hudson River. On the other side of the river, US 6 and US 202 run along the Hudson to Peekskill, where the two routes split, allowing US 6 to continue to the northeast into Putnam County. In Brewster, US 6 joins US 202 once again, with the routes running concurrently into Connecticut. US 6 runs for 116.3 miles (187.2 km) in Connecticut. It enters from the town of Southeast, New York, concurrent with US 202, shortly passes through begins the city of Danbury, and ends at the Rhode Island state line in the town of Killingly. In western Connecticut, US 6 either closely parallels or is concurrent with Interstate 84, serving as the local route in the suburbs of Danbury, Waterbury, Bristol, and Hartford. It crosses the Connecticut River (overlapped with I-84 and US 44) on the Bulkeley Bridge. In eastern Connecticut, US 6 is one of the principal routes connecting Hartford and Providence, R.I., passing through the small urban areas of Willimantic and Danielson. The unsigned portion of the Connecticut Turnpike then meets with US 6 shortly before crossing the Rhode Island state line. US 6 covers approximately 26.5 miles (42.6 km) in Rhode Island from Foster (western border with Killingly, Connecticut) to East Providence (eastern border with Seekonk, Massachusetts). In and around Providence, US 6 overlaps with Route 10, as well as US 1A, US 44, and Interstates 95 and 195. U.S. 6 runs approximately 117.5 miles (189.1 km) in Massachusetts, paralleling I-195 between Providence and Wareham, and serves as the local business route. US 6 continues onto Cape Cod across the Sagamore Bridge as a freeway from Bourne to Orleans. North of Orleans, it becomes a surface road again to its terminus in Provincetown. 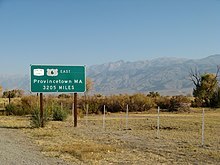 Although the west-bound sign in Provincetown has been updated to reflect the shorter terminus in Bishop, California, the east-bound sign in Provincetown still reflects the original coast-to-coast terminus of Long Beach, California (see photo). The first interstate numbering along the path of US 6 was Route 3 of the New England road marking system, designated in 1922. This route connected Provincetown with the New York-Connecticut border via Providence, Hartford, and Danbury. In late 1925, the Joint Board on Interstate Highways approved the preliminary plan for U.S. Highways. US 6 was restricted to New England and southeastern New York, with its vague description matching the existing Route 3 to Danbury, Connecticut, and heading west from there to U.S. Route 7 at Brewster, New York. By the time the final plan was approved in late 1926, a second section had been added, from the New York-Pennsylvania border at Port Jervis, New York west to U.S. Route 120 in Kane, Pennsylvania. This did not last long, for the April 1927 route log shows the eastern segment running only to the border of New York, short of Brewster, while the western segment was extended in both directions—east to Kingston, New York, and west to Erie, Pennsylvania (the latter replacing part of US 120). The western segment was also swapped with U.S. Route 106 between Carbondale and Tunkhannock, Pennsylvania, taking US 6 through Scranton. The gap through New York was eliminated in 1928 with a new alignment across the state, crossing the Hudson River on the Bear Mountain Bridge; the old route between Kingston and Port Jervis became the first U.S. Route 6N. While US 6 replaced the general corridor of Route 3 in New England, some portions used different alignments. One of these was on Cape Cod, where Route 3 had used a southerly alignment that is now Route 28. Instead, US 6 followed the more direct route between Buzzards Bay and Orleans that had been the southern extremity of Route 6, and now known as Route 6A. Farther west, in Connecticut, US 6 ran via South Coventry, while Route 3 had served Andover; the old route became U.S. Route 6A. US 6 is now on the old Route 3, while the South Coventry route now carries Route 31. A different alignment was also chosen for US 6 between Plainville and Woodbury; Route 3 ran via Milldale and Waterbury, and became parts of Route 14 and Route 10 in the 1932 renumbering. Here US 6 mostly remains on its original routing, with the main difference being between Hartford and Terryville, where US 6 followed the present Route 4, Route 10, and Route 72. The final difference was from Danbury west to the New York state line; here US 6 ran straight west, while Route 3 had left the Danbury area to the south, curving to the southwest through Ridgefield to the border. Part of this became U.S. Route 7, while the rest became Route 35 in 1932. In New York, US 6 replaced all of Route 37—known as the "Bridge Route"—over the Bear Mountain Bridge, overlapped part of Route 17, and was assigned to an unnumbered road from Middletown west to Port Jervis. The original route, which soon became US 6N, replaced Route 50, and is now part of U.S. Route 209. The part of US 6 in Pennsylvania replaced Route 7, also known as the Roosevelt Highway, an auto trail. The Roosevelt Highway Association extended the name east with US 6 to Cape Cod by 1930. Two other routes that would become part of US 6 were included in the 1925 plan: U.S. Route 32 from Chicago, Illinois to Omaha, Nebraska, and U.S. Route 38 from Lincoln, Nebraska, to Greeley, Colorado. As part of the fine-tuning during 1926, US 38 was extended east from Lincoln to Omaha, allowing U.S. Route 77, which had been assigned to this road, to extend north to Sioux City. These routes, which now connected end-to-end at Omaha, replaced a large portion of the Detroit-Lincoln-Denver Highway, which split at Princeton to bypass Chicago to the south via Joliet. They followed existing state highways: 2 and 14 in Colorado, 7 in Nebraska, 2 and 7 in Iowa, and 7 and 18 in Illinois. Most of US 32 and all of US 38 became a western extension of US 6 on June 8, 1931, and the Roosevelt Highway name followed. To connect western Pennsylvania to central Indiana, relatively minor roads (including the route for SR 6 in Indiana) were used, except west of Joliet, where it used a part of the old Detroit-Lincoln-Denver Highway. The short stub to Erie formed at the old west end became U.S. Route 6N, and US 32 remained in Illinois, running independently from Chicago to Princeton and overlapping US 6 to Davenport, Iowa. US 32 has since been absorbed into U.S. Route 34. The Roosevelt Highway Association continued to push for an extension, and in December 1936 the American Association of State Highway Officials made US 6 (and thus the Roosevelt Highway) a transcontinental route from Cape Cod, Massachusetts to Long Beach, California. It took a new route from Wiggins, Colorado, southwest to Denver (the old route to Greeley became an extended U.S. Route 34) and west over the Rocky Mountains to Leadville, overlapping U.S. Route 24 to Grand Junction and U.S. Route 50 to Spanish Fork, Utah. From Spanish Fork to Ely, Nevada, it followed a roadway that had yet to be improved in areas; the rest of the route, from Ely to Southern California, followed the old Midland Trail, running almost north–south in California. The unimproved segment from Ely east to Delta, Utah, about 160 miles (260 km) long, was, according to Business Week, "nothing but a wagon trail-rutted, filled with dust...one of the worst chunks of federal [sic] road in the country." Paving was completed in September 1952, with a two-day celebration in Delta marking the occasion. Major William L. Anderson, Jr. of the U.S. Army recommended that US 6 be designated the Grand Army of the Republic Highway, honoring the Union soldiers in the Civil War. The Sons of Union Veterans of the Civil War began pushing for the name in April 1934. Massachusetts, the first state to apply the name, passed a law to do so on February 2, 1937; it was not until at least 1948 that all states had agreed. The highway was formally dedicated at the Long Beach end on May 3, 1953, though the Roosevelt Highway Association continued to exist at least through the 1960s. As part of the 1964 renumbering in California, US 6 was truncated to its intersection with U.S. Route 395 at Bishop. The portions of the former route that did not overlap other routes, including US 395 and Interstate and State Route 110, were redesignated as State Route 14. Starting in the spring of 1983 U.S. 6 was a discontinuous route for almost one year, due to a massive landslide that destroyed the town of Thistle, Utah. The highway was rebuilt by blasting a path higher up the canyon wall. The landslide remains the most costly in the history of the United States. Since the 1970s, portions of US 6 in Iowa have been moved permanently onto I-80. The first section, between US 71 and Adair, was rerouted in 1972. In 1980, three lengthy sections were moved onto the Interstate: 26 miles (42 km) in western Iowa between Adair and Dexter, 25 miles (40 km) in central Iowa between Altoona and Newton, and 20 miles (32 km) in eastern Iowa between Wilton and Davenport. On July 1, 2003, 15 miles (24 km) between Dexter and Adel were turned over to Dallas County. US 6, which had previously split away from I-80 at the Dexter exit, was continued along I-80 to the US 169 interchange at De Soto, and then along US 169 to Adel. In 2015, the American Association of State Highway and Transportation Officials (AASHTO) approved a request from the Colorado Department of Transportation to eliminate US 6 through the city of Rifle, Colorado, meaning that US 6 is now discontinuous between Rifle and Grand Junction. US 95 in Coaldale. The highways travel concurrently to Tonopah. US 50 / US 93 in Ely. US 6/US 50 travel concurrently to Delta, Utah. US 6/US 93 travel concurrently to Majors Place. I‑15 in Santaquin. The highways travel concurrently to Spanish Fork. US 89 in Spanish Fork. The highways travel concurrently for just under 10 miles (16 km). US 191 north of Helper. The highways travel concurrently to east-southeast of Green River. I‑70 / US 50 west of Green River. US 6/US 50 travel concurrently to Grand Junction, Colorado. I-70/US 6 run mostly parallel between here and just east of Idaho Springs, Colorado with the two routes, joining, separating and crossing over each other several times in this span. US 24 northwest of Minturn (as part of a concurrency with I-70). I‑25 / US 85 / US 87 in Denver. I-25/US 6/US 87 travel concurrently through the city. US 6/US 85 travel concurrently to near Commerce City. I‑25 / I‑70 / US 87 in Denver. I-70/US 6 travel concurrently through the city. I‑76 northwest of Derby. The highways travel concurrently to northeast of Brush. US 34 northeast of Wiggins. The highways travel concurrently to west of Fort Morgan. US 83 in McCook. The highways travel concurrently through the city. US 281 in Hastings. The highways travel concurrently through the city. I‑480 in Omaha. The highways travel concurrently to Council Bluffs, Iowa. US 59 in Belknap Township. The highways travel concurrently to Oakland. US 71 in Atlantic. The highways travel concurrently to Pymosa Township. I‑80 / US 71 in Pymosa Township. I-80/US 6 travel concurrently to De Soto. I‑80 / US 169 in De Soto. US 6/US 169 travel concurrently to Adel. I‑35 / I‑80 on the Clive–Urbandale city line. I‑80 / US 65 in Altoona. I-80/US 6 travel concurrently to Newton. US 63 north-northwest of Malcom. The highways travel concurrently to north of Malcom. US 151 south-southwest of the Amana Colonies. The highways travel concurrently to south of the Amana Colonies. I‑80 in Sugar Creek Township. The highways travel concurrently to Davenport. I‑80 / I‑280 in Davenport. I-280/US 6 travel concurrently for approximately 0.824 miles (1.326 km). I‑74 on the Davenport–Bettendorf city line. The highways travel concurrently to Moline, Illinois. US 34 in Sheffield. The highways travel concurrently to Princeton. US 52 in Joliet. The highways travel concurrently through the city. US 30 in Joliet. The highways travel concurrently through the city. I‑80 / I‑94 in Lansing. The highways travel concurrently to Lake Station, Indiana. US 41 in Hammond. The highways travel concurrently through the city. US 421 in Westville. The highways travel concurrently to south-southeast of Westville. US 35 south of Kingsbury. The highways travel concurrently to South Center. US 33 in Benton Township. The highways travel concurrently to Ligonier. US 24 in Napoleon. The highways travel concurrently to Liberty Township. US 20 in Fremont. The highways travel concurrently through the city. US 20 in Lakewood. The highways travel concurrently to Cleveland. US 20 / US 42 / US 322 / US 422 in Cleveland. US 6/US 322 travel concurrently through the city. US 20 in East Cleveland. The highways travel concurrently to Euclid. US 322 in Conneaut Lake. The highways travel concurrently to Meadville. US 19 in Vernon Township. The highways travel concurrently to LeBoeuf Township. US 62 in Brokenstraw Township. The highways travel concurrently to Warren. US 11 in Clinton Township. The highways travel concurrently to Chinchilla. I‑81 / I‑476 in Chinchilla. I-81/US 6 travel concurrently to Dunmore. US 209 in Milford. The highways travel concurrently to Port Jervis, New York. US 9W / US 202 in Highlands. US 6/US 9W travel concurrently around the Bear Mountain Circle. US 6/US 202 travel concurrently to Peekskill. US 9 northwest of Peekskill. The highways travel concurrently to Peekskill. US 202 in Brewster. The highway travel concurrently to Danbury, Connecticut. I‑84 / US 7 in Danbury. The highways travel concurrently through the city. I‑84 in Newtown. The highways travel concurrently to Southbury. I‑84 in Farmington. The highways travel concurrently to Manchester. US 44 in Hartford. The highways travel concurrently to East Hartford. I‑84 / US 44 in Manchester. US 6/US 44 travel concurrently to Bolton. I‑295 in Johnston. The highways travel concurrently through the city. I‑95 in Providence. The highways travel concurrently through the city. I‑95 / I‑195 in Providence. I-195/US 6 travel concurrently to East Providence. US 44 in Providence. The highways travel concurrently to East Providence. ^ a b Iowa Department of Transportation (2012). State of Iowa Transportation Map (PDF) (Map). Ames: Iowa Department of Transportation. Retrieved March 1, 2014. ^ a b Joint Board on Interstate Highways (1925). "Appendix VI: Descriptions of the Interstate Routes Selected, with Numbers Assigned". Report of Joint Board on Interstate Highways, October 30, 1925, Approved by the Secretary of Agriculture, November 18, 1925 (Report). Washington, DC: United States Department of Agriculture. p. 49. OCLC 733875457, 55123355, 71026428. Retrieved November 14, 2017 – via Wikisource. ^ Automobile Blue Book: Standard Touring Guide of America, 1926 and 1927 editions, Vol. 1 (New York and New England) (Automobile Blue Books, Inc., Chicago)—fold-out maps and turn by turn guides show the Port Jervis to Middletown route as unnumbered. ^ Wellsboro Agitator, January 6, 1937: "The action taken at the recent San Francisco meeting of the American Association of State Highway Officials now gives it a single federal highway number from the Atlantic to the Pacific." ^ Iowa State Highway Commission (1973). State of Iowa Transportation Map (PDF) (Map). Ames: Iowa State Highway Commission. Retrieved September 29, 2010. ^ Google (September 29, 2010). "Overview of Iowa 925" (Map). Google Maps. Google. Retrieved September 29, 2010. ^ Google (September 29, 2010). "Overview of Iowa 926" (Map). Google Maps. Google. Retrieved September 29, 2010. ^ Google (September 29, 2010). "Overview of Iowa 927" (Map). Google Maps. Google. Retrieved September 29, 2010. ^ Petroski, William (July 1, 2003). "Road Transfer Draws Worry". The Des Moines Register. p. B1. ^ Iowa Department of Transportation (2003). State of Iowa Transportation Map (PDF) (Map). Ames: Iowa Department of Transportation. Retrieved December 27, 2013. ^ Iowa Department of Transportation (2004). State of Iowa Transportation Map (PDF) (Map). Ames: Iowa Department of Transportation. Retrieved September 29, 2010. ^ Special Committee on U.S. Route Numbering (May 14, 2015). "Special Committee on U.S. Route Numbering Spring 2015 Report to the Standing Committee on Highways" (PDF) (Report). Washington, DC: American Association of State Highway and Transportation Officials. Retrieved June 6, 2015. Wikimedia Commons has media related to U.S. Route 6.